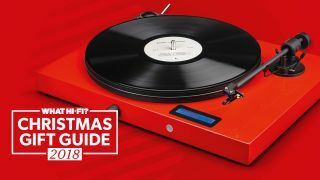 15 best Christmas gift ideas for vinyl lovers | What Hi-Fi? Even in a world where 4K TVs and thousand-pound smartphones have become the norm, there are still plenty of people who prefer the old-fashioned crackle of a record player needle on a vinyl LP. If you know know someone like that, and are on the hunt for a present for the vinyl lover in your life, there should be something on this list to tickle your fancy. This set of three wall-hung picture frames for you to pop your vinyl into, sleeve and all, helps your record collection double as interior decoration. Each frame holds any 12-inch record sleeve, including double and triple albums. And, thanks to the quick-release mechanism, you can swap the records without taking the frame off the wall, and change the look of your living room as often as you want. Based on Pro-Ject's highly-regarded Primary turntable, the Juke Box E is a true just-add-speakers deck, complete with Ortofon OM 5E cartridge, amplification and even Bluetooth connectivity. Moreover, it sounds fantastic, picking up an Award in our systems category this year. Love vinyl? Love cats? Then you'll love this. This scratch turntable serves two purposes. First, it keeps your cat from destroying your curtains – it will be too busy scratching seven shades out of the spinning 'platter' – and second, it will provide hours of entertainment as you watch your cat pretend to be a DJ. If neither your amplifier nor your turntable has a phono stage, then you need to add an external one. For under £100, the Rega Fono Mini A2D is our pick. It doesn't look much but it helps deliver great sound and even allows you to rip your vinyl to digital files. These are the gifts that keep on giving. A while ago we put together a list of the most interesting vinyl subscription services we could find, from specialist genre packages to those offering a bottle of plonk with each month's record. Jack White enthusiasts will be over the moon to receive a subscription to the Third Man Records Vault, while Vinyl Me, Please will hand you a special edition record and help you use up all that leftover booze with its tailor-made cocktail recipes. Going places with your record collection? This roll-top backpack from one of our favourite record shops, Phonica, can take up to 30 12-inch vinyl discs, protecting them and your torso with heavy-duty polyester and padded back, straps and base. Available in black, blue or green, it’s far more stylish than that bag for life you’ve been carrying them around in. This is basically a feast for vinyl collectors. Professional photographer Eilon Paz takes us into the hallowed record rooms of musicians, DJs, producers, dealers and enthusiasts – Questlove Gomez and Gilles Peterson both make the cut – and interviews the inhabitants about their mouth-watering collections. Prepare for your skin to turn green with envy. Now you can tell the time by your favourite record. You can add the name of any song – here they've gone for What Time is Love? – and a personalised message, too. Other suggestions include Rock Around the Clock, Second by Steppenwolf and 'hours...' by David Bowie. A well-balanced performer that works across a wide range of music, this Goldring cartridge is a fine way to upgrade your turntable for less than £100. This is made from a genuine Technics headshell, which should be a good talking point when you're helping strangers open their beer bottles at house parties. Do you own a lot of records? Could you open your own shop? Well, there's no need to go that far but you could at least get yourself better organised. This pack of 26 12-inch record dividers will do the trick and comes complete with A-to-Z printed labels for you to attach. More important than having your record collection in order is keeping it safe. These plastic sleeves will protect your LPs and their covers from damp and spills, and will help them hold their value if ever you decide to flog them on Discogs. Of course, no vinyl lover's gift guide would be complete without a record or two, but there's no reason you shouldn't add a little spice. Why not try Alexis Taylor's Piano accompanied by Listen With(Out) Piano for a dual-turntable experience, discover the locked and parallel grooves and floating hologram of Jack White's ULTRA edition of Lazaretto, or really push the boat out with a blood-filled limited edition of The Flaming Lips and Heady Fwends? It's when vinyl becomes art beyond the music. If you fancy setting up one of those Instagram accounts where people show-off their records and systems, then you could do with one of these stands. A simple but effective way to put your music taste on a pedestal – well, a solid wood block. It does look quite smart and solves the problem of where to put the 'Now Playing' sleeve, anyway. Opinion is divided when it comes these simple vinyl cleaners. There's certainly a school of thought – ignored by every household in the 80s – that you're better off letting your needle do the 'cleaning', and that a brush such as this tends to run the risk of forcing dust into the grooves rather than getting anything out. Certainly for a deep clean you need something more substantial, and more expensive, but for quick removal of surface dust, we think these brushes can help.